Last Sunday, I was taking a casual promenade down Henry Street when I heard someone calling me over. It was an old friend of mine, Liam Duggan, whom I met thirteen years ago. Liam and, his kindly friend Suzie’s smiling faces greeted me from where they were sitting at their charity table. The sun was shining down on them, almost like they were on a mission from God, ok maybe that’s too far. The merry duo were on a mission though, and had already raised €7500 towards it. Liam was holding a poster up in front of him that read “I might be crazy, but I am going to build a hospital”. “What do you think? Do you think I am crazy?” Liam asks me. The Hospital will cost an estimated €650 million to build and already €40 million was lost when the location of the hospital was moved. That is money that won’t be made back in the near future. And here is Liam and Suzie, trying to help what has for years been a very awkward situation – maybe there is a touch of madness involved. 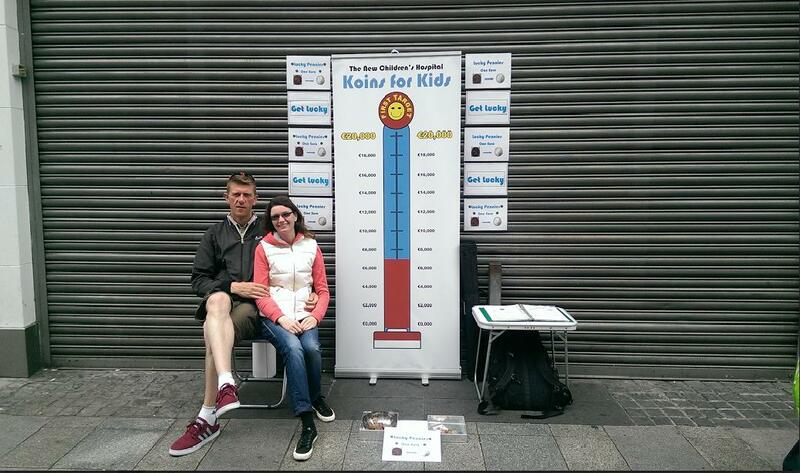 Liam Duggan from Sandyford and Suzie Barrett from Louglinstown are both students and have started a charitable fundraising for a charity they are calling “Koins for Kids”, in aid of hospital equipment for the New Children’s Hospital planned for James’ Street. Both of them are parents; Liam has two children, son Cúán (17) and daughter Sarah (8). Suzie has one son, Melvin (13). I recall him chatting about plans he had for all the old money he was collecting. Liam has been collecting coins for some time. I remember the jar of coins he held up to me back in 2011, little did I know it would eventually grow into a non for profit business and not just remain his hobby. Suzie is Liam’s long-standing partner, but also acts as trustee to the charity. They worked together to get this project off the ground. “My partner’s passionate efforts to support innocent sufferers inspired me to support and work as a team with him.” Suzie spends her weekends helping Liam on Grafton Street or Henry Street over the summer months. They are there involving the crowd and selling their lucky pennies in return for a euro. “We are now selling predecimal pennies as tokens at a price of one euro. I have seen these lucky pennies for sale on the internet in nice packaging for 10 to 16. They are a nice token like the daffodil on daffodil day. We have a source where we get these pennies and there are plenty of them available,” Liam also gets many donors bringing him old coins and new coins that they no longer want to hold on to, from all over the world. They get so much British money in donations that they sometimes travel up north to convert the British coins into Euros. Liam has had his ups and downs when it comes to trading on the streets of Dublin, even though it is a non-for-profit business, he still had to climb the mountain to avoid legal action or being asked by the Gardai to remove himself from areas like Grafton Street on trading days. He eventually got the thumbs up from the Gardai in town and now has an easier time working towards their target of €20,000, with no hassle or complications. The New Children’s Hospital will be built on the St. James’s Hospital grounds. The hospital has been in the news lately again as the plans for the building was unveiled on the 1st May 2015. Back in 2012 An Bord Pleanála decided to turn planning permission down for the original site at the Mater ground, which led to the St James’ site being eventually chosen. The hospital will, if all goes well, be finished by mid 2019. Planning admission will be put in at the end of next month with An Bord Pleanála, and then building will commence early 2016. Liam, a very passionate person, is full of hope for the future of “Koins for Kids”. So what is all the money for and where will it be going to then? Liam and Susi have a website called “Koins for Kids” – www.koinsforkids.ie – and were gifted by a web developer friend who did this for them for free. They have been helped by very supportive friends and family members to get all of this done and a lot of donations to make it work. Even I had to help out for a few hours and thoroughly enjoyed watching Liam talking to the public and getting their support. Some donors arrived there with bags of old coins and promises were made by many to bring in their old and foreign coins. Charitable donations are welcome if you can’t find Liam and Susi on Grafton or Henry Street, go to their website: “The bank details are on the website under the contact tab. www.koinsforkids.ie” Liam and Suzie will be on Grafton or Henry over the weekends this summer. If you have any old pennies you don’t want anymore, why not take it to Liam and Suzie, you won’t be able to miss their big white posters. Every penny kounts! Thanks Siobhan. Hope all’s good with you.